rec. Studio 1, State Broadcasting and Audio Recording House, Moscow, 2018. Weinberg's position in the constantly growing field of music recordings has been transformed since 1971. At that time his only representation was an EMI-Melodiya LP (ASD 2755) of the Symphony No. 4 and Violin Concerto (Kogan, Moscow PO, Kondrashin). Then a rarity in the West, now, twelve years after his death Weinberg recordings are legion. This is not to say that we should be content when the completion of the project to record all 27 of his symphonies remains over the distant horizon. This disc is the latest Weinberg entry. At the centre of things, for this disc, is the cellist Marina Tarasova and there we are in trusted and far from dutiful hands. She has a high-line track record with her recordings appearing first in the West on Olympia and later on Alto. There are many recordings of Russian works to her name and in that area of repertoire she bids fair to be the Russian equivalent of Raphael Wallfisch. That said, she seems to have eschewed standard and non-Russian repertoire. The recording accorded to Tarasova by Northern Flowers is super-vivid, red in tooth and claw and rippling with close-quarters voltage. It's all very much in keeping with the sheer intensity and irresistible energy of Weinberg's music. The Concertino for Cello and Orchestra came to light in 2016 and was identified as a fore-runner to the later Cello Concerto. The Concerto has been recorded before (review review review) but not this Cello Concertino which preceded it. In just over 15 minutes Weinberg delivers four movements in a style which for me counters the "Concertino" label. The mood across the four short movements is far from light. For a start, the four movements comprise two outward-facing Adagios. The first Adagio is coaxingly sad and very moving. The cello is almost immediately engaged and sings sorrowfully over the quiet clock or pulse of the orchestra. The Moderato espressivo speaks in tones of healing quiet. The melodies suggest the tango and Iberian forebears and Tarasova adopts a delightfully hoarse tone. The Allegro vivace is a wildly capering dance with a spectacular carborundum edge to the soloist's tone. Just for a fleeting moment or two the music even approaches jollity. The valedictory Adagio has the cello at first communing by itself. Then after a long solo preamble there is a quiet chant in the background from the orchestra which tenderly shadows Tarasova. In this early work Weinberg takes risks and covers a large tract of emotional material. I should add that there is also a Violin concertino op 42 not to mention a Fantasia for cello and orchestra. The Preludes were written for Rostropovich (who recorded the Cello Concerto) but he never performed them. They have been recorded before, and in two volumes now issued by Naxos. In 1996, the New York-based cellist Josef (or Yosif) Feigelson (review review) recorded them for Olympia in volumes 9 and 14 of that defunct label's distinguished Vainberg series (respectively OCD594 and OCD643). They are Preludes to what? Well let's not concern ourselves too much with nomenclature. Here in Tarasova's hands are 48 minutes of 24 Preludes which are unlikely to bore and this despite the unadorned sound of the solo cello. They are typically varied and their melodic contours take subtle and unexpected directions. Certainly, they occasionally follow Bachian style or Semitic flavours but not as often as you might expect. No. 18 Sarabande traces the sort of path we associate with Bach while Nos. 17 and 22 have a Jewish twist and wildness. No. 6 sings in a stratospherically high register for the cello. No. 9 has chaffing ways. The Tenth Prelude is waspishly fast and of a coarse woody texture. If you hanker after a Prelude that is inwardly buzzing and moodily morose try No. 11. The flighty No. 13 benefits from a type of hair-trigger arrhythmia. No. 16 is highly spirited and seems to catch a gadfly on the wing. Contrast this with the stop-start stutter of No. 19. Weinberg pulls off a strange commingling of train-like pulsation and conspiratorial atmosphere in No. 20. The chafing and chaffing of No. 21 is a landmark and comes before the confiding and tender cradling of the Menuet that is Prelude No. 24. 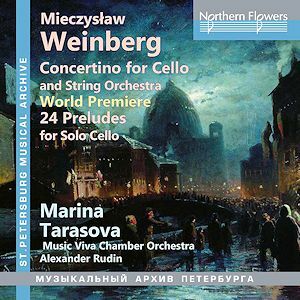 The Preludes were presented to Tarasova in an autographed edition when she studied with Weinberg in 1979. These recordings feel as if she has lived with them and imbibed their essence. Although I have not heard Feigelson, this factor may yet give Tarasova the edge if you have to choose. The treasurable Concertino will also help you choose over Feigelson who offers the Solo Cello Sonata No. 1 as a coupling. The experience of this disc is enhanced by some very full English-only notes compiled from information from Andrey Yurasov, Anna Weinberg and Alexander Volkov. This is a very satisfying disc and will deepen and widen your experience of Weinberg. Do not be put off by the coupling of orchestral and solo works, although you will benefit from a pause between playback of the two works.